When investigating a workplace accident, you might be inclined to believe that the employees involved should automatically be held responsible for the unfortunate incident. If so, you are taking what author Sidney Dekker describes as “the old view” of human error. Taking this old view, as the book reveals, will do little to prevent further unwanted incidents occurring. Therefore, The Field Guide to Understanding Human Error is an essential read for anyone with responsibility for preventing workplace accidents. Dekker recommends that human error investigators employ the “new view”. There are several differences between the old view and the new view, with the main difference being that instead of asking who is responsible, those who employ the new view ask what is responsible? Dekker believes that all employees go to work with the intention of doing a safe and effective job, or at least, a passable job, with the exception of what he describes as the “occasional bad egg”. After all, if they do not perform a job safely, employees become “the first at the scene of an accident”. Dekker outlines the local rationality principle as an important factor of human error. This principle does not just highlight the error made by the employee, but prompts the investigator to query why the error was made. The reason being, as Dekker explains, that “human error is systematically connected to people’s tools, tasks and working environment”. Therefore, Dekker recommends that human error should be the start of an accident investigation, instead of the conclusion of an investigation, which was accepted as an adequate termination of an inquiry under the old view. There are two recurring themes throughout The Field Guide to Understanding Human Error. Firstly, Dekker describes how “humans are inheritors of bad design”. To demonstrate this concept, he provides an example of how floppy disks went missing from a busy laboratory, only to be returned in suspicious circumstances. The disks were used to record work processes. Scientists were supposed to touch the disks only in the company of colleagues, who would act as witnesses. This process was generally slow. On most occasions, colleagues were not available to act as witnesses, and scientists brought the disks home with them to record the information. Dekker poses the question: Is the system or the scientist to blame for the error? Also, Dekker constantly encourages investigators to see the error from the point of view of those involved. Accident investigators typically review an accident from “outside the tunnel”. They know the consequences of the accident, have a reasonable understanding of what occurred, and have the benefit of hindsight. However, Dekker encourages investigators to investigate the accident from the perspective of those involved. What might seem like a stupid decision from outside the tunnel, might have been a reasonable decision as the accident was occurring. To gain an understanding of why an accident occurred, the investigator needs to determine exactly what was happening at the time of the accident, and explore the context of the event. If the task of conducting a human error investigation appears daunting, then fear not; Dekker outlines the process in Chapter 3. Dekker even describes how to accurately debrief participants, and how to deal with inconsistencies that may occur. The book also explores potential causes of human error. Dekker suggests that fatigue is a major contributing factor. Another significant factor is what Dekker describes as “buggy” or “inert” knowledge. The author explains how people may have been unintentionally trained to do a job incorrectly. The motive for this is that there may be a faster, more cost-effective method of performing a task, that is different from the description outlined by the product’s manufacturer. Thus, operators might have inherited a slightly erroneous method. One observation can be made as a result of Dekker’s revelation. Most processes are documented from the manufacturer’s perspective of how a product should operate. However, it can often be beneficial to observe and document a process as it is actually performed by operators. Doing so can identify any inconsistencies and can highlight potential risks. If you are interested in promoting a safety culture in your workplace, you will find this book to be a useful guide. The penultimate chapter provides tips for developing a safety culture. Again, Dekker describes differences between how this was previously done, and how it should be done in the new view. It is interesting to note how the author advises that employees should be used as a resource to promote a safety culture. Previously, employees were identified as a problem regarding safety. However, Dekker highlights how employees are the first to identify potential hazards. To promote a safety culture, Dekker advises that investigators should not just concentrate on areas with existing problems, where workers are already aware of potential hazards. Instead, he advises that the areas with little apparent potential for trouble are most likely to encounter an accident. The book provides an interesting insight into human error and outlines effective methods to prevent workplace accidents. 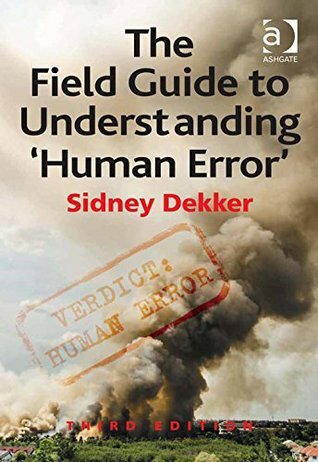 While it is not a new publication, The Field Guide to Understanding Human Error is still relevant; much material is widely available on the subject of human error, but this book distils the available information down into its key components, and hence is still very much worth revisiting. I concur with Dekker’s opinion that most employees strive to do an effective job, and that training and the workplace environment hugely influence human error. It is also interesting to note Dekker’s reference to the potential differences between the way in which a task should be performed, as suggested by the manufacturer, and the way in which it is actually performed in the workplace. Such variances highlight the necessity of reviewing and updating documentation on a regular basis, and of keeping workers aware of updates. Are you involved in investigating human error or workplace accidents? Have you applied Dekker’s approach? If not, are there alternative approaches that you find useful? We’d love to hear your thoughts. If you are taking a proactive approach to human error prevention, reviewing your process documentation is a great place to start. Our Business Development Manager, Emmet Kearney, can advise you on the first steps.